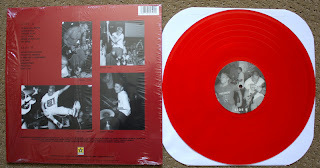 Back in May Revelation repressed BDTW on red and WNITA on white. 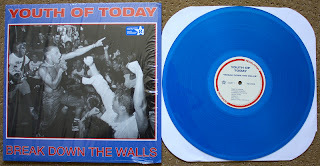 Turns out the Official numbers are /760 on red and /788 on blue for the 2012 repress. We all know the history of the BDTW on red, and if you don't then you should go read Marcus' account of it on Vinyl Noize. Since Revelation repressed it on red, we knew it was only a matter of time before it was released on blue as well. I am glad that I have a chance to own copies of this album on these colors now without having to pay hundreds and hundreds of dollars for them. However, I am slightly disappointed that these were released because it ruins the mystique a little bit surrounding the original releases of this album. I think it would have been more appropriate if Rev kept the red and blue colors but changed it up by making it a marble or splatter. Something to make it a little bit different from the originals. But hey, I'm just glad to own these so I shouldn't be complaining. Both colors look incredible, but I think I am more partial to the blue vinyl. Red just seems to be a much more common color. 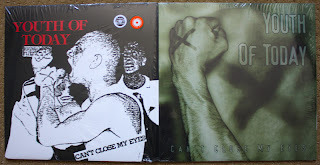 The earlier red copy has a black sticker on the wrapping that says it includes a digital download, while the blue copy has a blue sticker that says limited edition color vinyl. 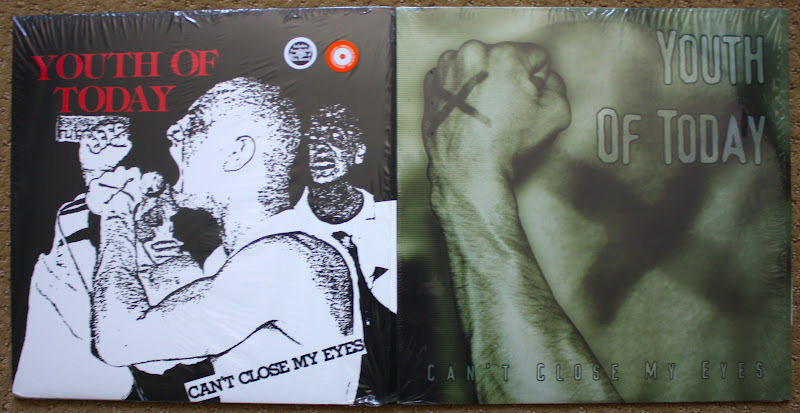 Both jackets look exactly the same with the same barcode number so these stickers may be the only way to differentiate sealed copies of these releases. Little things like these are why I prefer to keep the shrink wrapping on my releases. I would say this reissue cover is much better then Revelation's last effort. Here is WNITA on red, looking sharp! 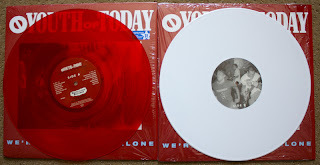 I prefer the red color over the white, but I typically just don't like white vinyl that much. This red looks exactly the same as the BDTW on red. 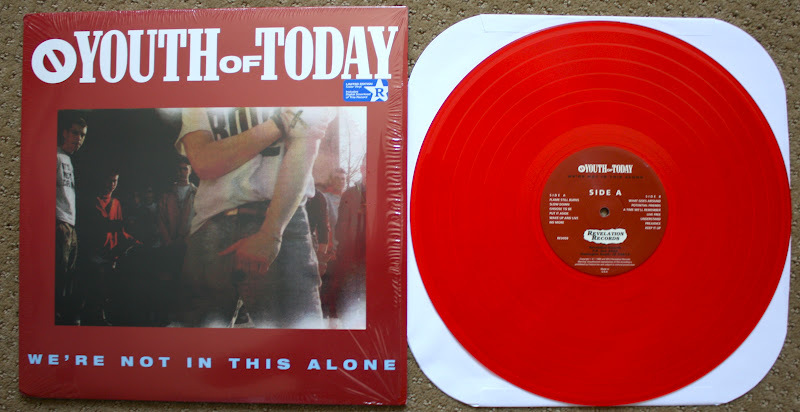 The Official pressing info for this is /770 on white and /790 on red. Here it is next to the white copy. It should be noted that the more recent red copy also has the blue Rev sticker on the front saying its limited edition color vinyl. Here is Rev's most recent reissue of CCME on clear. Looking pretty sharp as well. I have never been very fond of clear vinyl but it seems fitting for this release somehow. This clear version is out of /550. Here it is next to my red copy out of /443. The newer clear copy also has a an additional white sticker that is not on the red copy. Now that the purple copy of this release is out of press I feel the need to own it. I knew I should have just bought it when I had the chance. I'm glad Revelation is cutting out the corny reissue covers already. This ones far superior to the 1997 reissue, which was possibly one of the lamest covers ever! the first round sold out pretty quick.... if you want the blue copy of bdtw and the red of wnita i'd jump on it quick!